61% of January’s electricity production came from technologies which do not emit CO2. Electricity demand on the Spanish peninsula has increased by 3.4% in January. Wind power produced 5,961 GWh during the month of January and represented 25.3% of the total monthly generation on the Spanish peninsula. Wind power increased its production by 12.7% compared to the same month in 2018. 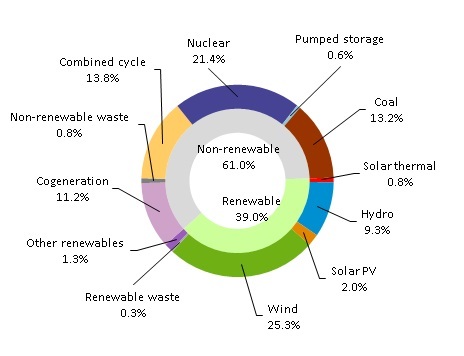 In January, generation from renewable energy sources represented 39% of the generation mix. Additionally, 61% of this month’s electricity production came from technologies which produce zero CO2 emissions. The demand for electrical energy on the Spanish peninsula in the month of January stood at 23,359 GWh, a value 3.4% higher than that registered in the same month last year. After factoring in the influence of the seasonal and working patterns, electrical energy demand on the peninsula increased by 0.9% compared to January 2018.